Loma Prieta Winery in California have started a Pinotage wine club, the first in North America to focus solely on Pinotage. Wine clubs allows members to buy wines at a discount and to receive regular deliveries of wines including special limited releases not generally available. Owner Paul Kemp says "This year we will receive fruit from three different vineyards and next year will also receive fruit from our estate Pinotage." To join or for more information contact Loma Prieta Winery here. I’ve had a couple of mystery Pinotages recently. The first is the attractively named Klippenkop 2008. That is on the new winelist of my favourite local Indian restaurant. For the past decade their menu hasn’t changed which meant that inflation made eating there become increasingly inexpensive. The wine list, inherited en-bloc from an even older one was dotted with basic generic names like Chablis, Liebfraumilch, Chianti, St Emilion etc and as the years passed so the restaurant sourced even cheaper representatives of these names till they could no longer buy some wine at less than what they were selling it. Gone from the new list are unfashionable unsellable Liebfraumilchs and their like, in come new world wines and, gulp, new prices. Klippenkop is modern clean fruit led wine, no rough edges, enough acidity and body to pair well with modern Indian cooking and I’ve enjoyed several bottles in the past weeks. But who makes it? Some online sellers say it comes from Robertson Winery but my email to them asking if it is one of theirs has not been answered. The A number is A371 which belongs to Vinfruco which I believe is now part of The Company of Wine People. Probably Klippenkop is a shippers label sourced from whoever has excess at the time. But I like to think there is a winemaker somewhere who lays claim to it and so if you know who made this wine please tell me, in confidence if you prefer. Bottelary Hills is the other mystery wine. There’s a newish promotional organisation called Bottelary Hills representing the wineries of this Stellenbosch Ward whose website states “Bottelary Hills will offer 2 brands, an entry / mid range brand named M23 and the other named Bottelary Hills which will be directed at the upper limits of the South African / New World range.” That’s pretty clear, then. Except in their reply to my email asking for more information they say it’s not their wine and they don’t know what it is. The wine is closed with screw-cap on which is printed Koopmanskloof – which is another winery in the area but not one listed as a member of the Bottelary Hills group and the number is A317. No wine labelled Bottelary Hills is shown on the Koopmanskloof website and my email to them remains unanswered. But what of the wine? Clean, some fruit but light bodied, even watery, workmanlike but unexciting. Seems only yesterday that Jeremy Borg launched his new Painted Wolf wine range and now a second label has joined the portfolio. 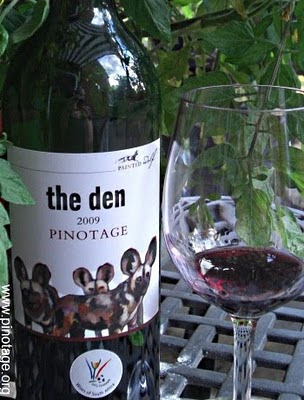 The Den Pinotage 2009 is immediately attractive with a bright luscious spicyness, good body and length. Clean modern winemaking at its best delivering a wine with character and interest which is just delicious. It's enjoyable drinking now. The Swedish alcohol monopoly Systembolaget has published its plans for 2011. 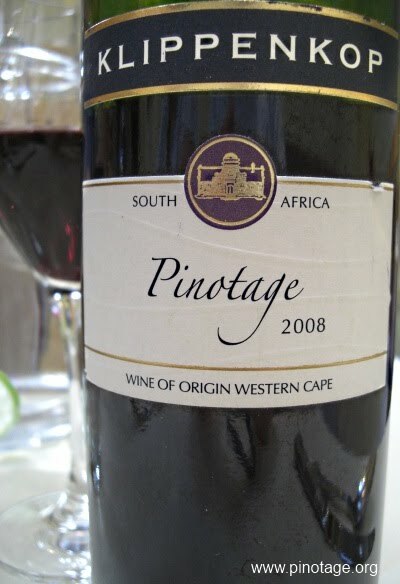 “We will continue to renew our selection of Pinotage wines from South Africa,” they say and are tendering for a minimum of 260,000 bottles of “modern style “Coffee Pinotage”. “We are looking for a full-bodied and tasty wine with substantial tones of roasted coffee, chocolate, spices and dark cherries. The wine should partly be aged and fermented in oak barrels.” They require a “Stelvin Screwcap closure” (hooray) and a “colour picture on the bottle with readable label.” Interesting, does that mean they want a Swedish language label? This wine will retail at between 70-99SEK. They also want 70,000 bottles of a 2010 Stellenbosch WO Pinotage to retails above 100SEK. The Systembolaget is one of the world’s largest single purchasers of wine, which isn’t surprising as it is buying wine for an entire country. For a consumer, if the Systembolaget hasn’t got it, then it doesn’t exist. Currently they list the following varietal Pinotages. Doesn’t look to me that the Systembolaget wine buyers get out the office much. That's not the list for one shop, that's the list for an entire country. 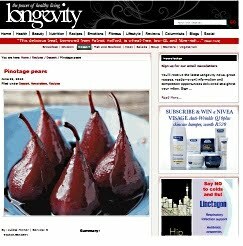 Juleta Hirner at Longevity magazine has an appetising recipe for Pinotage Pears which she says "is a gorgeous winter dessert that will impress your friends and warm their tummies too". It is winter in South Africa now, but I reckon this'll make a cracking summer dessert too -- chilled and served with vanilla ice-cream. "Half of Beyerskloof's 2007 vintage was exported," he says "suggesting a real rather than a cosmetic international demand. 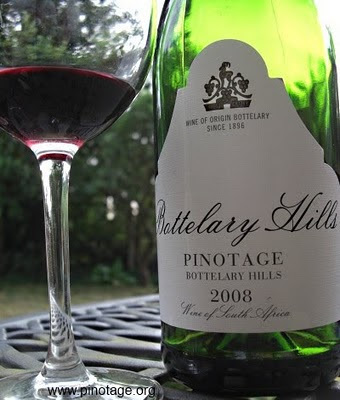 More importantly, it's a sign that once the sometimes aggressive tannins of pinotage are properly managed, there's an international market for its earthy flavours and smoky aromatic notes." Barista Pinotage has come to the USA, imported by the Indigo Wine Group, of Venice, Florida and being distributed throughout the country. 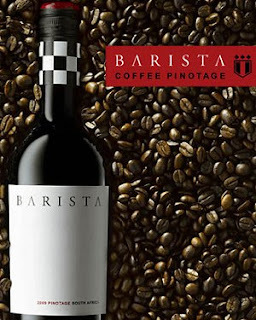 Barista, as the name implies, is a coffee accented wine maded by Bertus Fourie who pioneered the style a decade ago. The coffee flavours come purely from the wine: real coffee is no more used in its production than there is cats' pee in Sauvignon Blanc. The coffee flavours are accentuated by judicious oaking and choice of yeast plus Pinotage attributes.